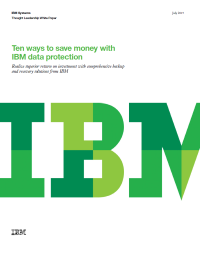 IBM has documented how users can realize significant cost savings by choosing IBM data protection software. Download this white paper to learn more. Addressing modern data protection challenges has become increasingly important, especially for organizations wishing to spend more time and money on their company strategy and resources instead of trying to secure their data.